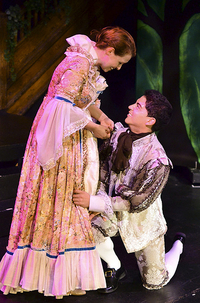 A not-for-profit theatre company dedicated to bringing dynamic theatre productions to Toronto audiences, StageWorks Toronto is pleased to announce its inaugural musical production, Into The Woods – playing at the Annex Theatre – 730 Bathurst Street – from August 18-21, 2011. Directed by Lorraine Kimsa and music directed by Tara Litvack, this production promises to entertain and enlighten mature audiences (12+). Into the Woods is one of Stephen Sondheim’s most loved musicals. This hilariously twisted show takes classic fairytale characters and weaves their stories into a modern musical in ways that are sometimes funny and often touching. It challenges us to examine the lasting impact our words have on our children and the loss of innocence. Act One ends with the song “Ever After”, where such tales usually end. Act Two takes audiences into a much darker realm: What happens after the happily ever after? What happens after Cinderella and her prince enter married life? What happens after the wolf has been slain? What happens when the dead giant’s wife returns to seek vengeance? Find out this August! All tickets for this production are $20 and can be purchased at http://www.stageworkstoronto.com.